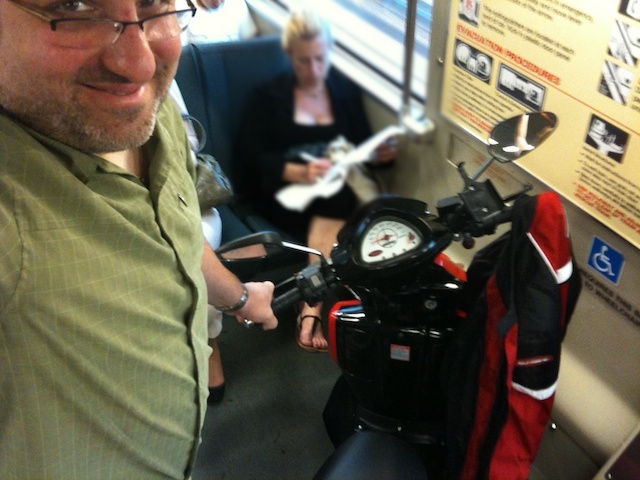 Today I had an excuse to try something I’d been meaning to do for months — take my Vespa-sized Electric Scooter on BART — for those not familiar BART is mass transit train system serving the greater San Francisco Bay Area. It’s both underground and above ground in different places. 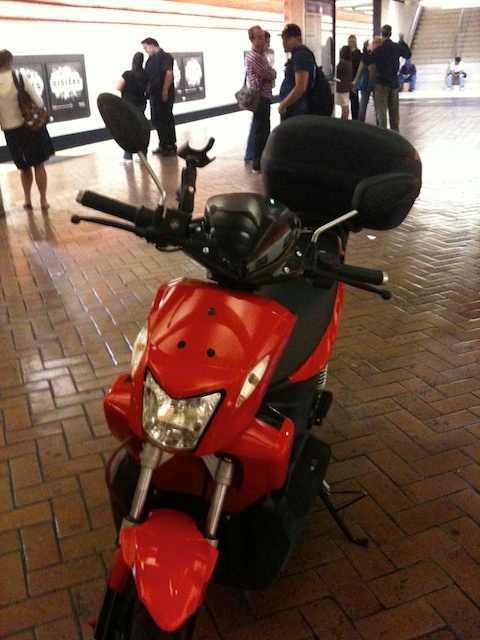 Anyway, I had paved the way by speaking to BART police a while back and I was told that the weight of my scooter was not in question, what mattered is that it didn’t have a gas tank so I could take it on BART. Tonight I needed to get to an event in the Presidio and didn’t have time to take public transportation the whole way, nor did I have access to our single car. So going meant taking the scooter on BART. Taking the scooter into the elevator at Ashby station went without incident. Keeping it steady on the train was not easy especially as I wasn’t able to position it into the spot that I had in mind. So I had to hold it with one hand (it has a kick-stand) clenching the break tightly while holding the bar over my head with my other hand. Not the most comfortable ride. Getting off at Civic center required awkward and careful maneuvering including navigating two separate elevators. The first big and easy to deal with. The second was a tight fit, and I needed to use the quick release on my GIVI case to remove the box and thus shorten the vehicle before it would fit. The station agent stopped me and I grew nervous. It turned out that he was just curious and wanted to see it up close. No problems, no delay. The ride up to the Presidio was the easy part with my trusty iPhone based Navigon navigation leading the way. The one challenge going there and back was the fog — it made it impossible to see clearly and necessitated that I raise my visor to see the road. On my way back, desiring just a little more adventure I stopped at SF City Hall where I know that Coulomb Technology has a set of three ChargePoint stations and I know from the free iPhone app, that one is generally available and sure enough it was. I charged up my scooter and took a few photos and chatted with friends at the same time. Then I decided to try a new station and rode to Powell Street. It was here that I had my first signs of trouble. As I approached the elevator, I had to walk my bike on the sidewalk. While I Was still a safe distance away, several men exited the elevator and headed the other way, two were cops and the others had been arrested. i didn’t want any unnecessary attention so I paused till they were out of view. Then I approached the elevator and pressed the call button. As I walked the bike into the smaller elevator, the station attendant started to lecture me over the intercom, “you can’t bring a gas vehicle on BART” she said. I let her know that it was electric and that it was fine. I took the elevator down to the station level and approached the other elevator which would take me down to the trains. The attendant stopped me and told me she had called BART police and I need to wait so they could clear things up. I started to get my papers in order and a minute later she told me they there weren’t going to be able to make it and that I could just go ahead. She then spoke as if to herself, about how they need to limit the size of vehicles on BART…. I breathed a sigh of relief!